Based in California, BIA Cordon Bleu has been crafting superb stoneware and porcelain dinnerware, serveware and bakeware for 65 years. From contemporary patterns to classic designs, our ceramics are created by skilled artisans to ensure the highest quality product. If you have a taste for something with a little pizzazz, BIA Cordon Bleu offers bowls and dishes with hand glazed, unique patterns and elegant designs. Our serveware is also available in a wide range of shapes and sizes to accommodate all your entertaining needs. Make and serve your favorite meals with BIA Cordon Bleu 16 ounce Stackable Bowls. The super white finish maintains a simple elegance. 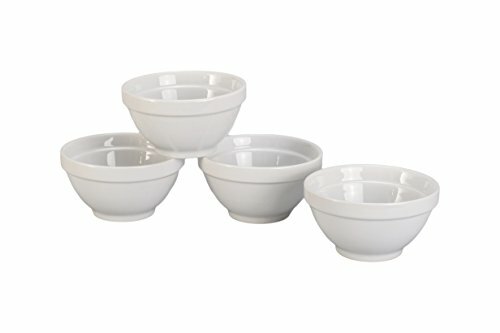 Made from high quality super white porcelain, this bowl resists chipping, cracking and staining. They are available in a set of 4, and are also oven, dishwasher, freezer, and microwave safe. View More In Bake & Serve Sets. If you have any questions about this product by BIA Cordon Bleu, contact us by completing and submitting the form below. If you are looking for a specif part number, please include it with your message. Tebery 2 Piece Clear Toughened Glass Baking Dishes, Oblong - 7" x 11.5" & 8" x 13.5"